That "bytes and megachips" line irked me then and irks me now. Shouldn't it be "chips and megabytes"? Message to self: move on. 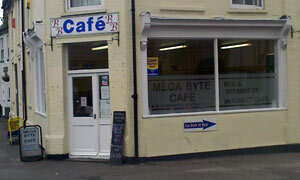 That lyric popped into my head after visiting the Mega Byte Cafe, situated on Ipswich's ungentrified Wherstead Road. This is on the bit that got bypassed a long while back, so finding it involves heading up Station St (off the Hawes St ring road) and turning right at the lights. Can't miss it. First day of the Suffolk Show and naturally the weather's not great. I'm on the drag and turn up to find A&G piling in to their Mega Byte all day breakfasts. Need a large plate to hold two of everything, and there's tea and toast thrown in. Smaller ADB for me in the form of a satisfying bacon and egg sub, helped out by some brand name condiments: Sarsons, HP, Heinz. Cracking range of soft drinks to be had in the fridge, inc. new flavour Oasis, milkshakes and ginger beer, a pleasant change from the regular yard of Coke. I can't honestly recommend the coffee (I'll 'fess up to stopping at the station for an AMT special on the way home), though the syrup sponge pudd did the job. Intriguingly there's a photo on the wall of Ian McShane and Dudley Sutton, aka Lovejoy and Tinker, all smiles at the Mega Byte. Perhaps this goes back to when an episode was filmed over at the docks? There's papers, kids' meals, machines of the cash and fruit variety, WiFi (!) and they offer bed & breakfast. The various leaflets -- Grapevine, Pulse festival -- and notices -- Can You Grow The Biggest Pumpkin In Ipswich? -- hint that this is the rarity that is the neighbourhood caff. It's all much nicer than you'd think. If it was a car -- Peugeot Bipper.